PROPERTY SUMMARY A detached three bedroom house which is situated in a popular residential area within easy access of Horndean village with its restaurants, pubs and selection of shops, it is also within easy access to the A3 (M), local schools, recreation grounds and commutable road links. 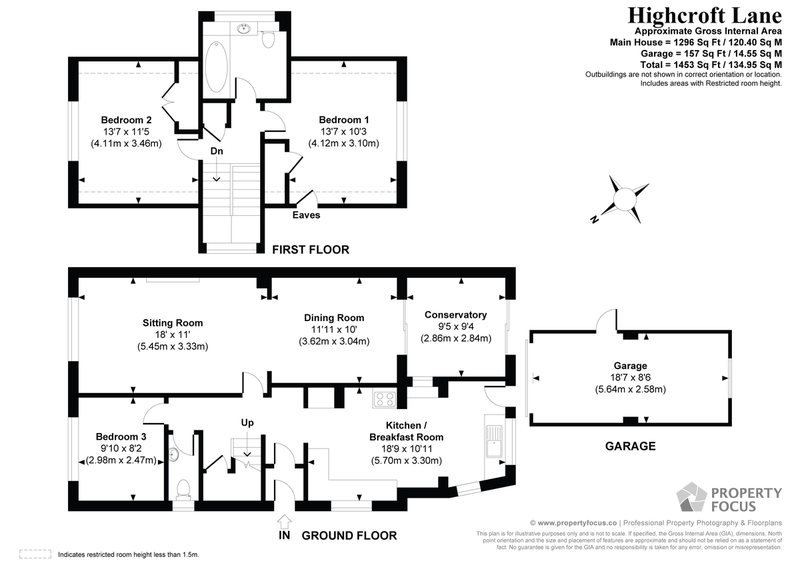 The accommodation is arranged over two floors and comprises; hallway, bedroom 3, cloakroom, sitting room leading to dining room, conservatory and 18' kitchen/breakfast room on the ground floor with two double bedrooms and a bathroom on the first floor. Offered with gas fired central heating, double glazing, off road car parking and a garage (restricted) as well as an enclosed rear garden, early internal viewing is strongly recommended in order to appreciate both the accommodation and location on offer. HALLWAY Staircase rising to first floor with understairs storage cupboard housing gas and electric meters, alarm panel, power points, radiator, textured ceiling and coving, ceiling spotlights, central heating control switch, doors to primary rooms, arched opening leading to kitchen. CLOAKROOM Low level w.c., radiator, double glazed frosted window to side aspect, textured ceiling, wall mounted wash hand basin with tiled splashback. BEDROOM 3 9' 10" x 8' 2" (2.97m x 2.44m) Double glazed window to front aspect with radiator under, textured ceiling, glazed panelled door, power points. DINING ROOM 11' 11" x 10' 0" (3.61m x 3.05m) Sliding double glazed patio door with panel to one side leading to conservatory, radiator, textured ceiling and coving, power points. CONSERVATORY 9' 5" x 9' 4" (2.84m x 2.82m) Polycarbonate glazed roof, double glazed sliding patio door with panel to one side leading to rear garden, radiator, wall lights, power points. KITCHEN/BREAKFAST ROOM 18' 9" x 10' 11" (5.72m x 3.33m) Decreasing to 9'2" at narrowest point. Comprehensive range of wood fronted wall and floor units with roll top work surface, wall mounted 'Worcester' boiler supplying domestic hot water and central heating (not tested), double glazed frosted window to side aspect, space for fridge, ceramic tiled surrounds, corner display shelving, dresser style unit with glazed panelled doors to upper section, drawers and cupboards under, gas cooker point, integrated fridge with matching door, recess to false chimney breast with gas point, extractor hood, fan and light, radiator, breakfast area. Double glazed frosted window to side aspect, double glazed window with door to one side leading to rear garden, inset single drainer sink unit with mixer tap and cupboard space under, washing machine point, power points. FIRST FLOOR Landing, double glazed window to side aspect, access to loft space, built-in storage cupboard with shelf. BEDROOM 2 13' 7" x 11' 5" (4.09m x 3.45m) Measurements taken from approximately 3'8" off floor level with eaves to either side ceiling restricting headroom. Built-in double doored wardrobe with hanging space and shelving, ceiling spotlights, double glazed window to front aspect with radiator under, power points. BEDROOM 1 13' 7" x 10' 3" (4.09m x 3.05m) Measurements do not include recess for door opening, built-in storage cupboard with range of shelving, double glazed window to rear aspect overlooking garden with radiator under, power points, access to storage eaves. BATHROOM Coloured suite comprising; panelled bath with hand grips and 'Mira' shower over with folding shower screen, vanity unit with oval wash hand basin, mixer tap and cupboards under, tiled shelf, low level w.c., with twin flush with shelf over, double glazed frosted window to side aspect, radiator.